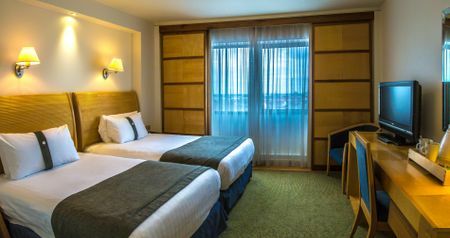 The Holiday Inn Preston is the perfect place to stay, relax and enjoy all that Preston has to offer for both leisure and business visitors staying with us. From the minute you check in, our friendly and helpful staff will be only too pleased to assist you in every element of your stay. From ensuring both your accommodation and dining requirements are not only met but exceeded and providing you with information about the local area. Spoil yourself in the delightful comforts of our hotel rooms. All rooms are equipped with high-speed internet access, Free WiFi in all bedrooms, flat screen TV’s showing Freeview tv channels, toiletries and coffee and tea making facilities. A "Great Nights Sleep" is guaranteed with blackout curtains, comfortable duvets and your own choice of pillows from our extensive pillow menu. Enjoy a relaxing night in this modern bedroom. Facilities include free Wi-Fi flat screen tv air conditioning power shower work desk and a hairdryer. Your non-smoking room features 2 single beds with comfy mattresses premium bedding and a choice of pillows ensure a good night’s sleep. Sleep soundly in our double rooms. Facilities include free Wi-Fi flat screen tv air conditioning power shower work desk and a hairdryer. Your non-smoking room features 1 double bed with comfy mattress premium bedding and a choice of pillows ensure a good night’s sleep. Holiday Inn Preston is ideally located for fantastic short breaks and weekend stays. Offering excellent facilities including spacious accommodation from which to explore the city. The Holiday Inn is at the centre of the City of Preston but also only 2 miles from junction 31 of the M6 motorway. It is just a very short walk from the hotel to Preston Guildhall & Charter Theatre for a great night out and the wonderful Harris Museum which is a must to see for children (and adults) of all ages. 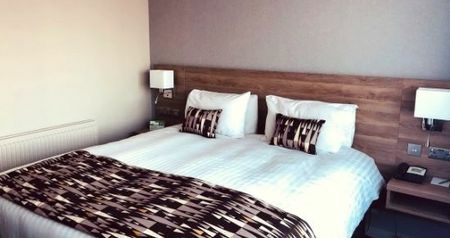 The hotel is located opposite the bus station and is 15 minutes' walk from the University of Central Lancashire (UCLAN). Within short driving distance, you can also visit the famous Blackpool Pleasure Beach including Nickelodeon Land and enjoy the coastal town which is only 19 miles away from the hotel or slightly further afield the stunning scenery of the Lake District is only 40 miles ways. As a City, Preston has so much to offer which means that your short break will be filled with plenty of excitement and will leave you wanting to visit us again and again. Don't forget St Georges Shopping Centre and the Fishergate Shopping Centre. Start your night out at Ringway Bar & Grill for some local dishes like Lancashire hotpot for dinner and then join us for our daily hot breakfast buffet. Ideally suited to meet the needs of the business traveller, each guest bedroom has been designed with a dedicated work area, modem point and direct dial telephone lines. Further facilities include colour flat screen TV, tea and coffee making facilities and of course the most important item, a luxury bed with a choice of 5 pillows from our pillow menu, designed to offer you maximum comfort during your stay. This central Preston hotel is 2 miles from junction 31 of the M6 motorway, and has car parking. Manchester Airport is 41 miles away, and the hotel is 40 miles from the stunning scenery of the Lake District. The hotel's conference centre has 5 meeting rooms with wireless Internet and a breakout area, and there is an Executive boardroom on the 7th floor with impressive city views. Your Guest room has high-speed Internet so you can work anytime, and you can order from Room Service 24 hours a day. The sophisticated Ringway Bar & Grill has a daily hot breakfast buffet, as well as local dishes like Lancashire hotpot for dinner. BAE Systems, Royal Preston Hospital, Preston Crown Court & Magistrate Court, Government offices, IBM offices and the University of Central Lancashire (UCLan) are all within easy reach of the hotel. The easy way for free stays and so much more earn points or miles for you and your family every time you stay, making your membership ever more rewarding. A few of the benefits Points for hotel stays or airline miles 4,700 locations to earn and redeem points Transfer points between accounts Extended check-out until 2pm (upon request and availability) Complimentary weekday newspapers.